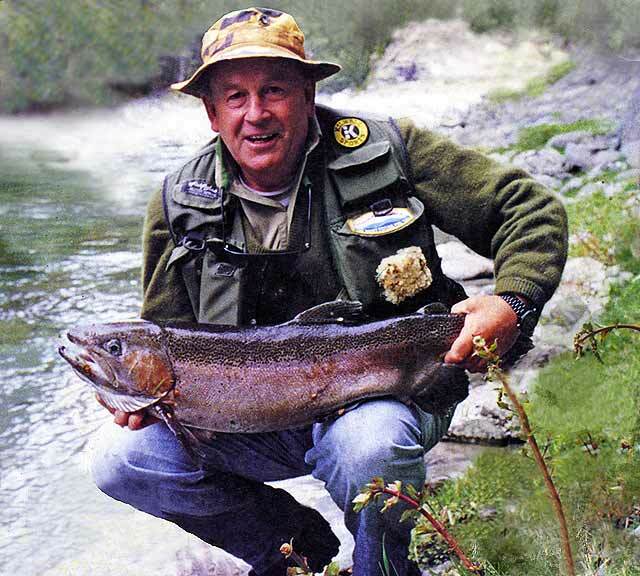 Monty Wright with 12 lb rainbow hen from the Caples River. Photograph John Todd. It was a beautiful clear morning as John Todd and I left Glenroyden Lodge at Glenorchy to motor round to fish the Greenstone River. This trip takes about 40 minutes and there are some excellent views of Lake Wakatipu as you motor down the side past Kinloch to the Greenstone carpark. As we jumped out of the vehicle ready to prepare our gear for the day’s fishing there was a sharp chill still in the air and a slight breeze blew down the Greenstone Gorge. The decision was made to carry just a little lunch as we intended to fish the rough gorge which meant a lot of clambering up, down and over rocks and through the bush. We walked onto the new bridge just to the left of the carpark, which has been a decided asset for trampers to the new Greenstone Valley with a much easier access up the true right bank than the “gutbuster” that used to be on the left. Over the years that first few rises in the track into the Greenstone many have broken many trampers’ and anglers’ hearts, especially if they were not fit. From the bridge we observed two or three fish rising and moving in the water. These must have been reasonably sized fish as we were quite a way above the water on the new bridge. We made the decision that the ones you can see and are feeding should be attempted so we clambered down through the bush to try and catch these trout. As expected by both John and I it was easier said than done. John moved out onto the first rock, cast into the fish and had little success. Unfortunately, he had less success on his return as he slipped off the rock into water that was much deeper than he expected – and also much colder as the water reached the Maker’s name. He was out of the water in a flash, teeth chattering and saying words which we cannot print. We moved on up the valley casting to some nice fish, but unfortunately not doing too well. John left me to persevere with a couple of trout that were just a bit far away on the far side of the Greenstone. I thought as he wandered off “possibly here goes our first mistake.” Being experienced anglers we should both have known better and stayed together as some of these fish were none too small. I came over a large rock and in the water were two fish feeding. The depth looked about 1.5 metres and both fish appeared to be about the 5-6lb mark – quite normal for this section of water. I decided to change to a heavyweight size 10 Hare’s Ear Nymph. By this time John was over 100 metres away from me and obviously would not be able to assist unless he turned around and saw me with either of these fish on. Of course, this was wishful thinking at this point. I tied the nymph securely and prepared to cast, making sure I cast out to the side to get the distance before I placed the nymph in front of the first fish. Keeping as low as possible so I would not form a silhouette behind me I decided that distance and everything were right and now was the time and cast the nymph four metres upstream and to one side. At it slowly sunk in the water current the fish observed it and moved forward. I tensely waited for the line to stop. It did and I lifted the rod, successfully hooking the fish. As it moved to one side I observed it was a brownie and quickly looking around the area I had to land it in, decided there would be no problems, that is providing the fish did everything it should do! But being unpredictable, like all trout are, it’s decision was different from mine, preferring the far side of the stream from where I was. Over it went, taking me right down to the backing. Then downstream it came – yes and you’ve guessed it – right around a big large rock that was sitting over there, hooking the line in front of it. It carried on downstream, still pulling the line in this obscure L-shaped curve around the rock, doing irreparable damage to my fly line no doubt and the joint as the backing also came out and went around the rock. I still didn’t panic at this stage as there was plenty of backing still on the reel and I was sure that he had enough brains to head back upstream and go back around the rock so I could catch him. Who said that – fish with brains! No way! Or did it really have brains as there was nothing I could do about it? The river must have been 12 metres deep out from me and you wouldn’t have lasted long if you’d tried to swim across to free the line from the rock. So a waiting game started. Then the beautiful brown trout decided that the best place in the river to be was right where I had hooked it and headed straight for that position. It ended up being three metres from my feet but with the line going right around the rock. What a predicament to be in. How long would this last? By this time John had disappeared around the corner, but I knew he wouldn’t have swum for me anyway and who could blame him. At this point, I got my first really good side on look at this fish and as per usual in gin clear water made that fatal mistake that the fish was much larger than I first thought. It was obviously about an 8lb brown jackfish in good condition and with plenty of strength. It sat in the water in front of me for at least 10 minutes. The depth of the water was about 2.5 metres at this point and I couldn’t do anything about it. I attempted to let as much line out as possible to see if it would shift, but no – it stayed there. This fish definitely had a mind of its own. It was time for drastic tactics so I took my hat off and waved it in the air. It surely got the message and headed downstream but things weren’t going too good at this stage with the line still round the rock on the far side of the river. With a few large bangs and pulls he was gone. I surveyed the damage to the fly line, which was very minimal considering it had been around a rock in the middle of the stream, but I guess it had been well smoothed by the pounding of water and stones it had taken over the years. I headed on upstream to catch up with John who had little success and I told him the story. “Why didn’t you yell out?” he said. “Yell out be buggered, you were over 100 metres away and couldn’t hear a thing. What could you have done anyway?” I said. John informed me at this point that there should have been more fish in the area than we’d seen and suggested that we head on up the Caples and Greenstone confluence. For those of you who have tramped this area, you will be familiar with the pool that you see from the rock just below the confluence. As per usual there were those annoying rainbows down there, swaying backwards and forwards in the water. Would our skills be good enough to catch them today or would they be teasing more anglers like they have done for years in this pool? Yes — you’ve guessed it – we were going to be teasers again – so down we went to attempt to catch them. The pool is much deeper than the average angler thinks so I stopped for a second and changed over to a sink tip line. This is the advantage of having Leader fly reels – you can change very quickly and it turned out to be to my advantage. John fished through the pool with his normal dry fly line – not touching a fish. 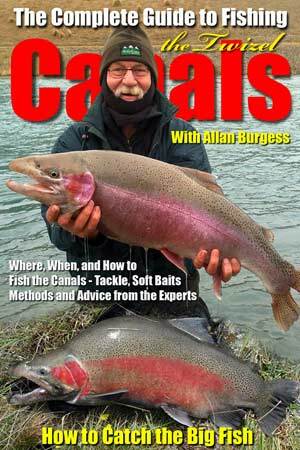 As I approached the pool behind him, on the second cast – bang, a nice 3lb rainbow in good condition, was hooked up, caught, and returned back to the water. A few paces further on as John moved out of the pool up into the run ahead I hooked another fish – a jack about the same size, but unfortunately not so good condition so I again released him to the water. As I caught up with John he was having a frustrating day. He had nicked several fish but unfortunately hadn’t landed one. 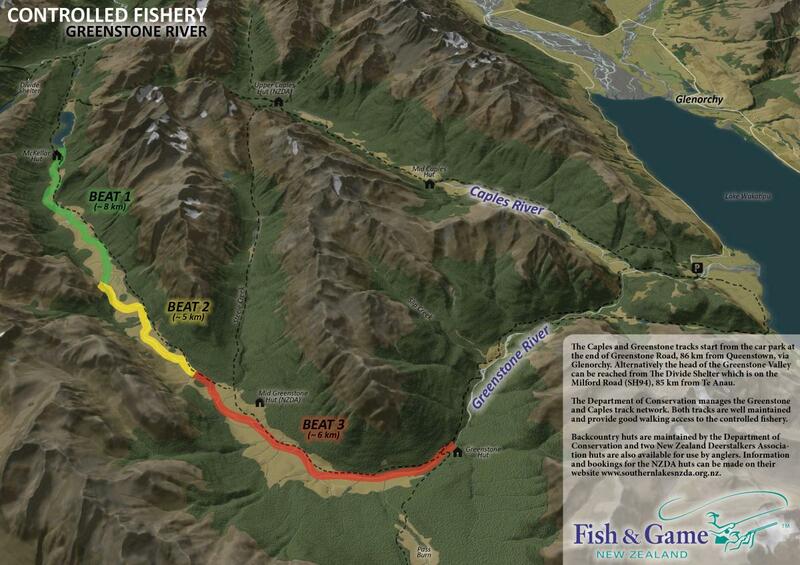 We decided to fish up to the Greenstone Bridge and then cross over to fish the Caples. We walked the high bank between the bridge and the river and John spotted a nice brown trout sitting at the edge. He decided to put on a dry fly and drop back to attempt to catch this fish. While I waited for him to come up to the fish I swapped my line back from my sink tip to my Hardies ﬂoater. John’s first cast over the fish was perfect and obviously, the fish thought so too as he quickly rose to the surface and took the fly off the water. “Still got the dry on,” he said. “You’re on,” I said. I got down to the water’s edge and had several casts to the side just to make sure the length was right and cast it just under the beech trees. This was no straight, ordinary cast, you had to put a bit of angle on it just to get it in the right place. Everything landed successfully. I hoped the nymph was heavy enough for the fish on the surface not to see it and it drifted down right past the big fish – but it didn’t even look at it. The small fish on the surface never moved either. I lifted it out of the water and cast again – the same side. No action – exactly the same thing, but as the line drifted over the small fish he obviously observed it and started to slowly slip back in the water current. I retrieved what line I had to, stayed motionless as he slid on by. “My God – that fish is about 3lb or 4lb,” I said to John. “You’re not kidding – that black rock that’s out there is a lot bigger than that,” said John. “At least if I don’t catch the fish I’m a jug up anyway,” I said. I cast again with exactly the same effect. The fish never moved. “Maybe it’s blind in one eye,” I said to John. “I’ll try the other side.“ This, unfortunately, was the side which I was on. I prefer to cast on the other side so that as they move forward to take it the hook comes across the mouth, but everything had to be tried now that three casts were unsuccessful. Three more casts and we were still unsuccessful on the other side. As I lifted the fly line off the water again I was wondering how I was going to catch this fish and what would I use – a big feathered lure downstream to it may be – a change of nymph – maybe something bright green and as I cast back under the beech tree again I muffed it, not allowing enough for the swing and the cast ﬂew out to the side, but on the right side of the fish. It was at least three metres away. The nymph sunk in the water column and the fish started to move. John yelled out, “It’s seen it, it’s going to take it.” “I see that just wait,” I said. “I’ll wait ‘till the line tightens,” and then it did. I lifted the rod into the air and it burst into life. There were three or four sharp tugs of the line as it realised that something was wrong. It headed upstream and then across to the other side. The fish continued to stay on the far side then it moved upstream again, then dropped back down opposite us. I’d be lying if I said that I wasn’t shaking at this stage as the adrenalin was pumping pretty fast. I was thinking to myself, “If only we can get this fish out this will be the biggest rainbow trout I’ve ever caught in my life.” We had no net and it would have been of little value to us anyway. There was a small eddy at the side of the river and John and I were thinking in unison at this stage. We both looked at each other and looked at the eddy and thought if we could get the fish round into that eddy we should have a go at getting it out as quickly as possible. John said, “I’ll get into position ready.” It was like calling a cue in a show. He got into position, knelt down and watched what was happening and the fish swam immediately across to our side. I took all the line up no trouble at all. Everything was going sweet and was as if we had told it – it immediately swung downstream at a leisurely pace and swung straight round into the eddy. I got all the line in successfully and moved my feet into the water alongside it. John said, “It’s now or never – let’s do it.” He grabbed the front, I grabbed the back and we ran straight up the bank. A very surprised rainbow hen weighing 5.5kg (12lb) lay bouncing on the grass. My heart at this stage was worse than when the fish was in the water, even though we had secured it. John and I both looked at each other. We both knew what we were going to say next. There was no way that fish was going back. This fish was going to grace my wall for the rest of my life and probably for the majority of my children’s. I’m generally not into taking fish out of high country streams but an opportunity like this usually only comes once in a lifetime and I quickly carried out the necessary blow with a small piece of wood. We then admired her – a fish at the top of her peak. Although she had severely damaged fins from spawning she was far from young. The necessary photos were taken and I reached into the back of my fishing vest to pull out a long, narrow trophy bag which I carry all the time just in case this opportunity comes along. From the Caples to the carpark only seemed a matter of minutes as I strode down the track with my head high in the clouds and very light feet on the rocks. It was an occasion never to be forgotten and possibly one that may never come my way again. See also the nearby Routeburn River. Important note about changes since this article was written. A Controlled Fishery Period applies from February 1 to March 31 each season on the Upper Greenstone River, from its source at Lake McKellar to the Sly Burn confluence. The aim of the Greenstone Controlled Fishery is to manage angling pressure on the Upper Greenstone River during the peak angling season to maintain a high-quality angling and wilderness experience. The Controlled Fishery Period requires anglers to make a booking in order to fish the Upper Greenstone River and ensures anglers will have exclusive angling access to a determined stretch of river (a beat) for the period of their booking. Further information on the Greenstone River Controlled Fishery is available here from Otago Fish & Game.